OnApp Cloud gives you a complete set of virtualization management, cloud management, storage, networking, DevOps, billing, provisioning and automation tools in one consistent user interface. OnApp clouds can be created on almost any commodity x64 infrastructure, and across heterogeneous compute and storage hardware. All cloud functionality is controlled via a customizable HTML5 web interface, and is also accessible via OnApp’s full REST API. 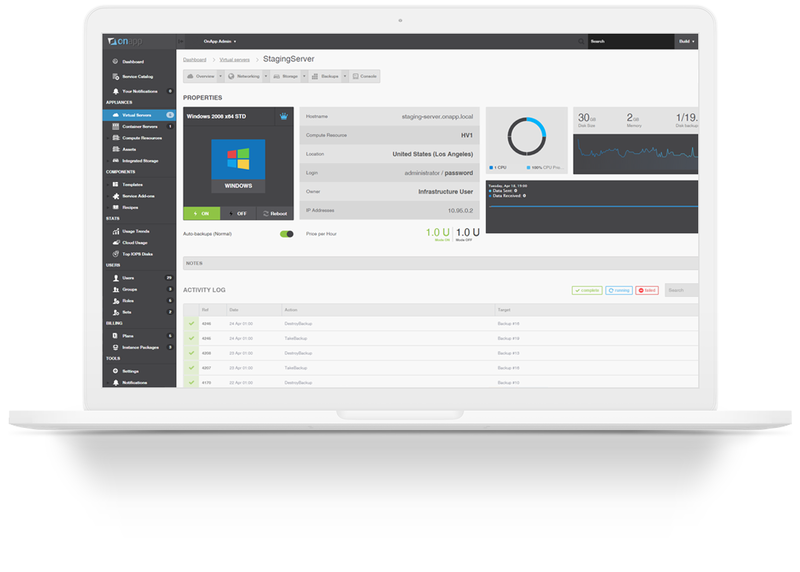 OnApp includes a fully customizable, HTML5 control panel that streamlines workload management, enables self-service, and uses intuitive wizards and GUI controls to make cloud management and provisioning as simple and efficient as possible. Everything from the system architecture to virtual server root access can be controlled via the UI. Every OnApp cloud capability can be managed through the OnApp UI, which is shared by your teams and your clients. What each user can see and do is determined by OnApp’s highly granular Role-Based Access Control system. The OnApp UI can be localized fully for your language and currency of choice. You can bill in any real-world currency, and virtual currencies too, and display localized versions to specific users or groups of users. You can brand the control panel with your own look and feel, or use our open API to integrate with a third party portal. Different UIs can be shown to different users or groups. You can insert third party portals into the OnApp UI, and have helpdesk, billing or other SaaS systems available in the same place. These can be set up with single sign-on to provide a seamless, unified experience for your users. OnApp automates provisioning of the full range of IaaS cloud products. OnApp can deploy virtual servers (VMs) on Xen 3, Xen 4, KVM or VMware; container servers (VMs based on CoreOS/Docker); application servers (virtual servers with pre-installed apps); bare metal servers; smart servers; and edge servers for CDN. Choose from hundreds of Linux and Windows OS and application templates, create your own templates, import from OVA, or Bring-your-own-ISO for server creation & recovery. The provisioning process can also automate installation of apps, tools and frameworks, and include your own custom services. OnApp automates deployment of dedicated bare metal servers, and can also deploy smart Servers, which use a thin virtualization layer to deliver cloud benefits like autoscaling and failover – while leaving the majority of server resources available to a single tenant. OnApp virtual servers can automatically scale up, and out, based on configurable thresholds, with dynamic pricing for consumed resources. OnApp virtual servers can fail over automatically, too: if a local compute node is unresponsive, they are hot migrated to a healthy node if possible. OnApp’s secure Role-Based Access Control system enables customers to provision their own cloud servers and adjust resources according to the limits and plans you put in place. 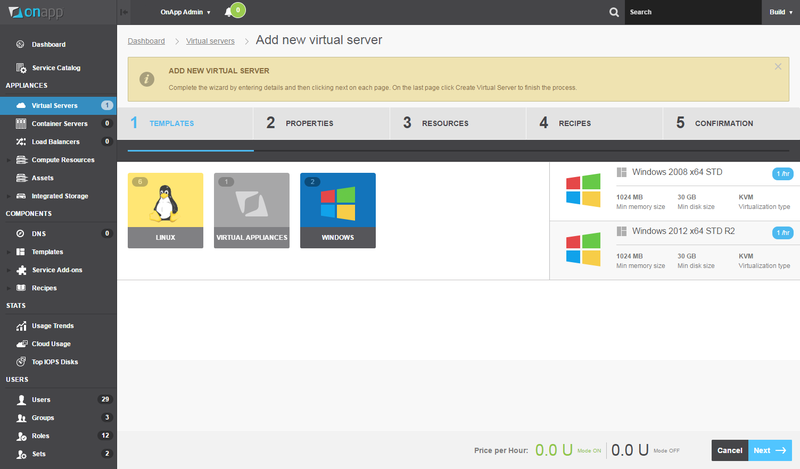 You can also disable self-service entirely, and manage the cloud on behalf of your clients. OnApp includes a multi-layered security engine and fine-grained control of user roles, permissions and limits – plus a range of tracking, logging and approval tools to improve governance across your cloud environments. OnApp makes full use of hypervisor firewall features, while adding our own isolation features on top: these enable secure VLAN sharing, isolate VM data and traffic, and include an additional anti-sniff, anti-spoof firewall. OnApp also handles Whitelists, password generation and policies, and supports user-configurable firewalls. Use OnApp with external authentication system connections (OAuth, SAML) and with two-factor authentication support, via Yubikey. 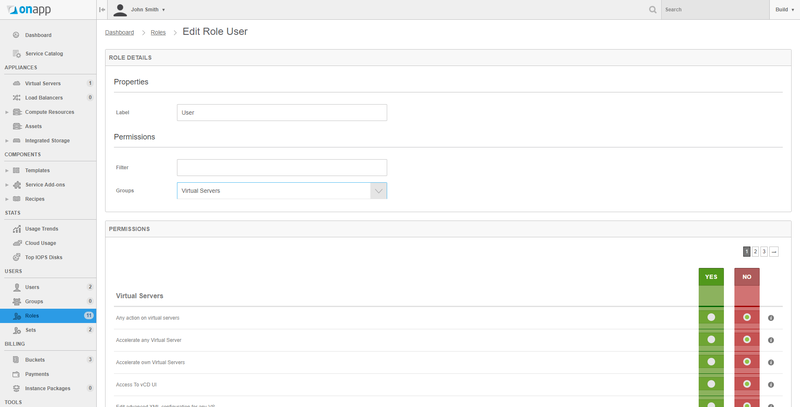 OnApp enables you to create any number of user roles for customers, resellers, VIPs, billing teams or support teams, and have fine-grained control of what each user role can see and do with your cloud. OnApp includes extensive transaction logging and reporting, with customizable alerts (email & SMS) and a flexible approval system for cloud resource requests. OnApp includes a high-performance software-defined storage system. Designed for cloud workloads, it gives you fast, resilient and scalable storage for your cloud, without having to invest in proprietary SAN hardware, or compromise performance with a software SAN. There’s no vendor lock-in with supported disk types or custom network backplanes: you can use the hardware you’re already using for your cloud. OnApp distributes data across disks in your cloud’s compute nodes, while giving you full control of replication and performance. Each physical disk in acts as a self-managing, self-discovering and self-contained unit, able to make decisions about data synchronization and load balancing without depending on a central controller. Disks are hot-pluggable between compute nodes, and there is no single point of failure. 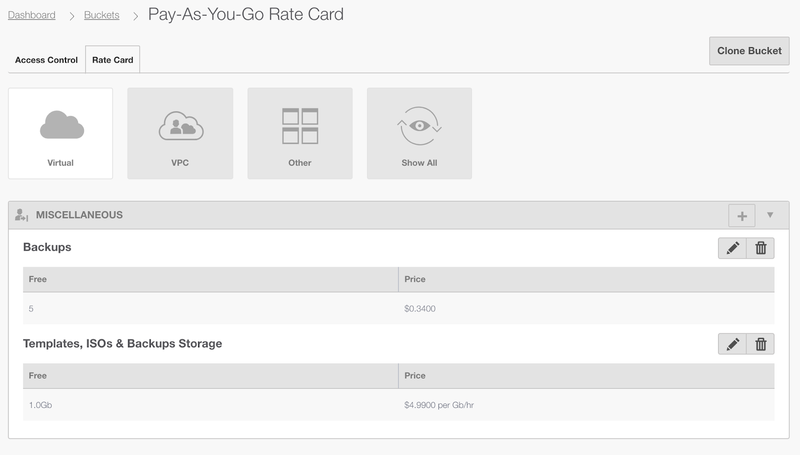 OnApp optimizes I/O for your cloud storage to deliver close to raw disk performance. Each disk’s I/O queue is independent, so there is no single point where bandwidth bottlenecks can occur, and each storage node manages and compresses its own content in the most efficient way possible. Our unique VM-aware technology also improves throughput by ensuring that a copy of a virtual server’s data is on disks in the compute node that server is running on. By decentralizing storage management, OnApp enables you to scale out storage naturally as your cloud grows. You can add more disks to compute nodes whenever you need to, without having to rebuild the whole SAN – or add new compute nodes and include their storage too. OnApp storage supports mixed disk types, and enables you to scale storage independently of compute. You can create performance tiers and manage billing for multiple tiers of storage, just as you would with a traditional SAN. You can also use OnApp’s storage system alongside traditional storage arrays, with different tiers of storage based on different SANs in the same cloud. OnApp clouds are secure, self-healing and extremely resilient, with multiple backup schema, automatic hypervisor failover, High Availability support, and disaster recovery options for real-time remote replication and restore. If a local compute node is unresponsive, virtual servers and smart servers are hot migrated to a healthy node if possible (this depends on the OS). Failover thresholds are fully customizable. If you need extended backup functionality, you can connect OnApp with specialist backup systems like Veeam and R1Soft. Backup plug-ins make it easy to combine your OnApp cloud with third party solutions. 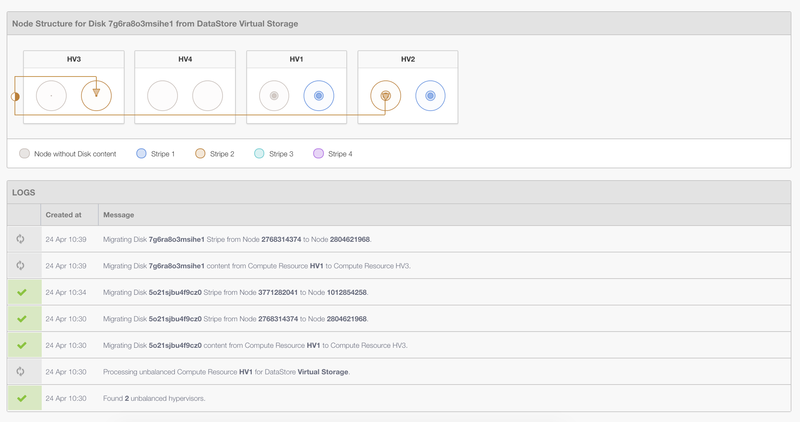 OnApp can schedule, meter and bill for virtual server snapshot backups. Virtual Servers can also use incremental backup. You can deploy multiple dedicated backup servers as part of your cloud, or use your control panel server. 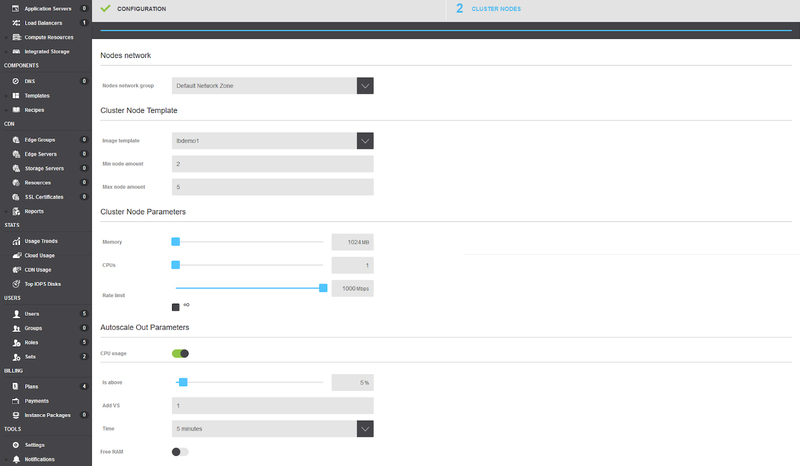 OnApp includes Disaster Recovery capabilities: you can replicate virtual servers in real time between two or more of your OnApp cloud locations. OnApp Cloud focuses on monetization as well as orchestration. It gives you full control of user access to cloud resources, and billing for cloud resources, and brings them together in one place. You can set prices, free resources and limits, and calculate bills for all of your infrastructure, for any number of users, groups or organizations. Easily create access policies for different users, groups or organizations consuming your cloud, and determine how (or if) each user type is billed. By separating access and billing for cloud resources, OnApp gives you the flexibility to create a huge range of cloud propositions, with utility pricing, contract-based pricing or a mix of both. You can use OnApp to sell everything from a single VM to a complete managed private cloud. Set prices and calculate bills for CPU cores, CPU priority, RAM, primary and storage disks, backups, IP addresses, networks, IOPS, DNS, Templates, recipes and different server types. Create and price different zones for dedicated & cloud servers, performance tiers & locations. OnApp has pre-built integrations to WHMCS, HostBill and Ubersmith, and a full API that simplifies integration with other systems. OnApp also facilitates export of cloud billing data to standard formats for integration with traditional EDR/CDR-based Business and Operational Support Systems. OnApp supports software-defined networking, making the network as agile and flexible as the virtualized server and storage infrastructure of the modern data center. 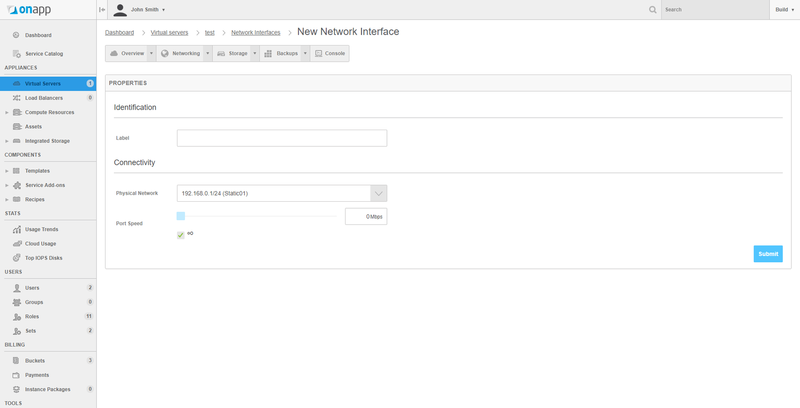 OnApp SDN gives you the ability to manage networks using VXLAN technology across OnApp cloud compute resources – so you can build level-two network infrastructure with OnApp on top of existing IP (level-three) networks. OnApp clouds scale from a handful of servers to hundreds of nodes per cluster. These are suggested specifications only – please get in touch for more information.